Liberally spray an 8x8 baking pan, set aside until ready to use. In a bowl stir together cream cheese frosting and dulce de leche until well combined. 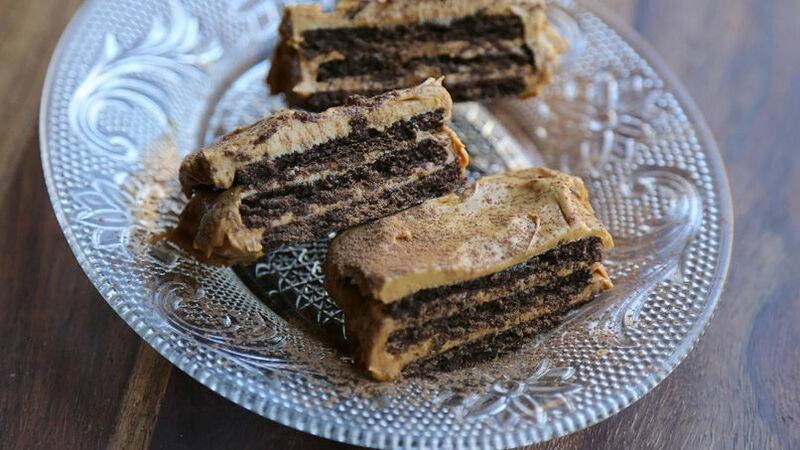 Line the bottom of the baking pan with chocolate graham crackers in a single layer, lightly brush each graham cracker with brewed coffee and evenly spread a layer of dulce de leche frosting over graham crackers. Repeat this process: make a layer of graham crackers and brush with coffee. Evenly spread on dulce de leche frosting two more time ending with a layer of dulce de leche frosting. Cover and place in fridge overnight. When ready to serve, garnish with cocoa powder, slice and serve. Swap out any thin chocolate wafer cookies for graham crackers or add a drizzle of chocolate sauce after each layer of frosting. A chocotorta is a festive chocolate dessert from Argentina. Layers of cookies, lightly brushed with coffee and topped with a heavenly layer of whipped topping create a beautiful dessert perfect for entertaining. With a little help from betty Crocker you can make this dessert in under 10 minutes.